Join us today, Friday April 5th, for our wine tasting event from 5-8PM! ’17 Farmstong White Blend, Central Coast: This wine opens with aromas of citrus beeswax and crisp and tart apples, On the palate this wine has a silky texture that is expansive and bright with notes of mandarines, wet gravel and white flowers, while being framed by its lingering acidity and finished by its soft minerality that reminds one of ocean breezes on a cool day. Pair this wine with a cold fish dish like sushi, poke or ceviche. 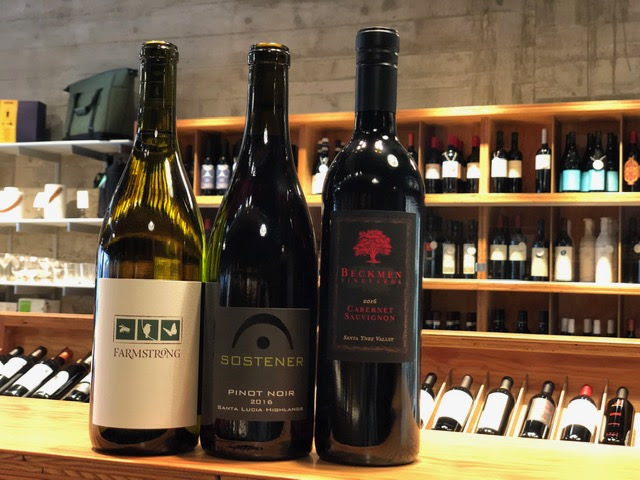 ’16 Sostener Pinot Noir, Santa Lucia Highlands: This wines leaps from the glass with aromas of pepper-marinated blueberries and blackberry with subtle hints of mocha. Even though this wine has a medium body, its complexity is surprising and showcases black cherries dusted with soft baking spices, toasted coriander seeds and it’s framed by an elegant tannic structure. Enjoy this wine with a grill lamb falafel and garlic-yogurt sauce. ’16 Beckmen Cabernet Sauvignon, Santa Ynez Valley: On the nose this wine showcases layered notes of ripe red cherries, leather, lavender, pepper and pencil shavings. Meanwhile on the palate, the medium body expands into rich peppery black berries, blueberries and wild sage that extends with subtle hints of red cherries, dark chocolate, fennel blossoms and olive tapenade. The finish is long and energetic and begs for savory contrast. Pair this wine with braised chicken thighs served with harissa chickpeas.